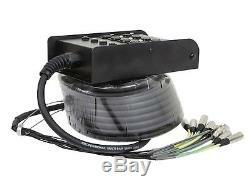 12-Channel Snake & 8 XLR x 4 TRS Stage Box - 50 feet. Connect your mixing board to your stage performers with this 50 foot 12-channel XLR/TRS Snake with 8x4 Stage Box from Buyers 1. This professional audio snake features 8 downstream and 4 upstream connections. The heavy duty stage box measures 12" x 7" x 3. It has 8 female XLR connectors (numbered 1-8) and 4 female TRS connectors (lettered A-D), a convenient handle on one end, and mounting holes so it can be secured to a wall or floor position. The fan end of the snake features eight male XLR connectors (downstream) and four male 1/4 TRS connectors (upstream). The XLR and 1/4 connectors have metal bodies and the XLR connectors feature rubber strain relief boots. The main cable has an outside diameter of about 0.6. Each downstream line is numbered to match the numbers on the stage box, while the upstream lines are marked R1-R4 to correspond with the A-D connectors. This stage box is also a great way to keep your stage clean and uncluttered when used as a sub-snake for drums or other backline gear. Check out our other listings. We guarantee our customer 100% satisfaction. The item "12-Channel Snake & 8 XLR x 4 TRS Stage Box 50 feet" is in sale since Thursday, January 8, 2015. This item is in the category "Musical Instruments & Gear\Pro Audio Equipment\Cables, Snakes & Interconnects".1st_choice" and is located in Rancho Cucamonga, California. This item can be shipped to United States, Canada, United Kingdom, Denmark, Romania, Slovakia, Bulgaria, Czech republic, Finland, Hungary, Latvia, Lithuania, Malta, Estonia, Australia, Greece, Portugal, Cyprus, Slovenia, Japan, China, Sweden, South Korea, Indonesia, Taiwan, South africa, Thailand, Belgium, France, Hong Kong, Ireland, Netherlands, Poland, Spain, Italy, Germany, Austria, Israel, Mexico, New Zealand, Philippines, Singapore, Switzerland, Norway, Saudi arabia, Ukraine, United arab emirates, Qatar, Kuwait, Bahrain, Croatia, Malaysia, Brazil, Chile, Colombia, Costa rica, Dominican republic, Panama, Trinidad and tobago, Guatemala, El salvador, Honduras, Jamaica, Bahamas, Viet nam, Uruguay.